LMU Researchers have made it possible to tweak the color of light emitted by an LED by modifying the size of their semiconductor crystals. They recently discovered a clever and cost-effective way of accomplishing this, which lends itself to mass-scale production. 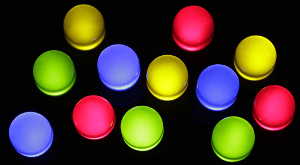 In contrast to the old incandescent light bulb, light-emitting diodes (LEDs) generate light of a distinct color within the spectral range from the infrared to the ultraviolet. The precise wavelength of the emission is established by the chemical composition of the semiconductor used, which is the critical component of these devices. In the case of a few semiconducting materials, the color can also be tweaked by suitably altering the size of the crystals of which the light-emitting layer is composed. In crystals with dimensions of a few nanometers, quantum mechanical effects start to become prominent. LMU Researchers in partnership with colleagues at the University of Linz (Austria) have currently formulated a technique for the creation of semiconducting nanocrystals of specific size based on the inexpensive mineral oxide known as perovskite. These crystals are very stable, which guarantees that the LEDs display high color fidelity – a vital criterion of quality. Furthermore, the resulting semiconductors can be printed on appropriate surfaces and are therefore predestined for the production of LEDs for use in displays. The key element in the new technique is a thin wafer, measuring only a few nanometers in thickness, which is patterned to resemble a waffle. The depressions act as miniature reaction vessels, whose volume and shape eventually define the final size of the nanocrystals. Optimal measurements of the size of the crystals were obtained using a fine beam of high-energy X-radiation at the Deutsche Elektronen-Synchrotron (DESY) in Hamburg. Moreover, the wafers are made by means of a cost-effective electrochemical process, and can be formed directly into LEDs. Our nanostructure oxide layers also prevent contact between the semiconductor crystals and deleterious environmental factors such as free oxygen and water, which would otherwise limit the working lifetime of the LEDs. In the following step, the team wants to further improve the efficiency of these diodes, and study their potential for use in other applications, such as flexible displays.